Sometimes catches and clasps stop working, beads and pearls come unstringed and chains get broken. 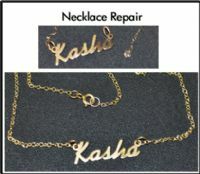 Wear and tear or accidents can mean your necklace needs a little TLC from the professionals. That’s where we come in, with a full service of necklace repair, so you don’t have to be without a favourite necklace for long. 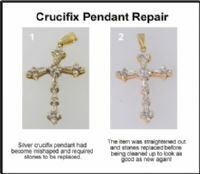 From a knotted chain to a broken catch, a damaged pendant or a string of pearls that’s come apart, have your necklace restored to its former glory by our expert team. You can be sure we will treat it with care and respect while carrying out the repairs in our dedicated showroom.